Recap – February 2016 : Squad – Communicate. Coordinate. Conquer. After a very busy six weeks post EA launch the development team has spent the past month digging into more of our core game systems in an effort to get them closer to our final vision. We will show you some of the progress in this update and also push some of the finished content out with our Alpha v5 update which is going through a hardening phase currently before moving into release candidate testing. Our Lead Environment artist and foliage wizard GhostDance has been carefully plugging away at our next generation of foliage. Our next iteration will start to integrate vertex pivot bending allowing interaction of players and foliage. As well we will be adding more natural looking procedural wind system. Both of which we have examples of below! 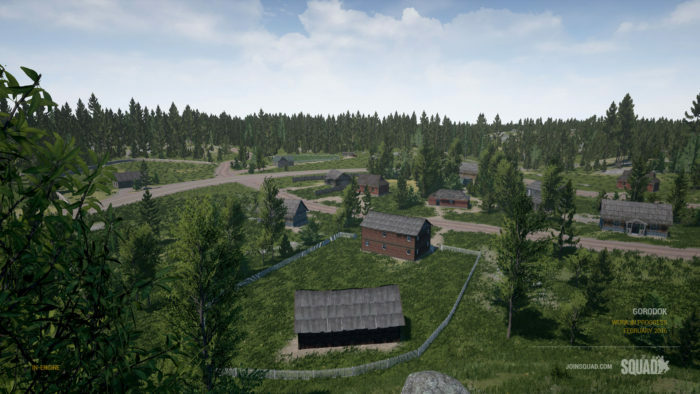 Since the last update a lot of effort has been poured into the map, user interface and general quality of life by JrWebster and Motherdear. The ongoing improvements of our user interface systems has allowed the gameplay programmers to focus more on improving the look and feel of some of the core spawn and map features, as well as making the system leaner and easier to implement future features. The main focus has been to move the map towards a C++ implementation and to fix any bugs that were plaguing 4.0, such as map and spawn menu switching back and forth, not being able to switch directly to the map from the spawn menu, roles not always being displayed as used etc.. Among these changes we now have a cleaner and more informative kit system, both for our menu and our ammo crates, as well as brand new map icons to improve map readability. The spawn menu has been improved with new icons, better displaying which weapon the player will get with the kit, making each spawn menu unique for the faction, as well as better drawing the eyes to specialty kits. 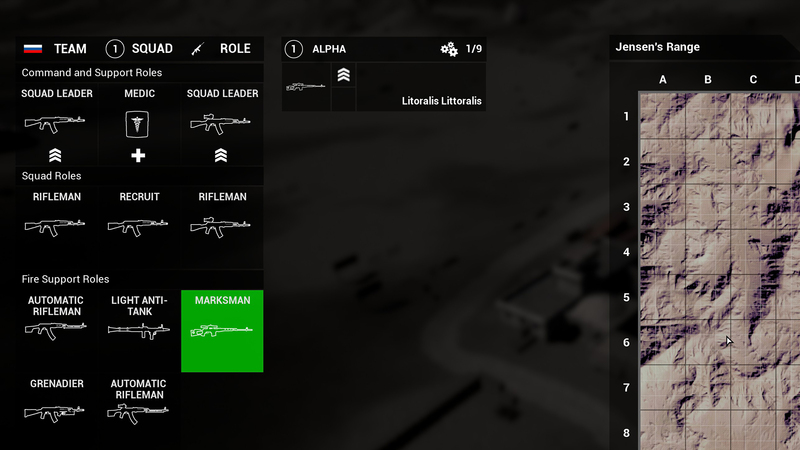 This also brings some improvements to squad management since the squad leader no longer is in doubt of what weapons are available in his squads arsenal. 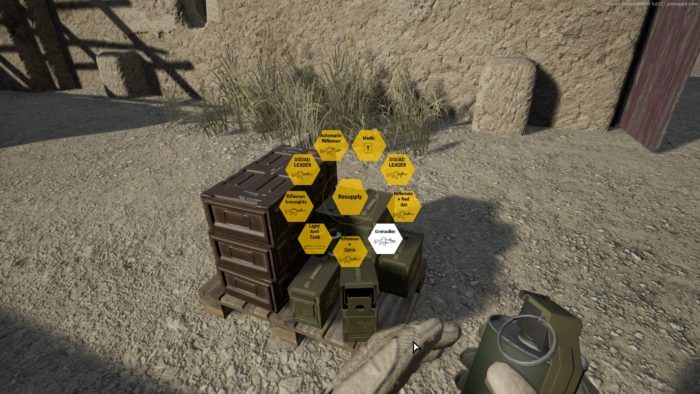 The ammo crate kit icons now clearly display what role they are and what weapon will be your most important, the icons are now more unified with the spawn menu and less language dependent, both in art style and functionality, allowing the users to have the standard kit tooltips and readability of the spawn menu. The players map icon now slowly pulses to allow you to easily find your own position, other players directions and important features, like medic and SLs are now easier to find on the map, and the mouse wheel and button zoom now functions much better than in earlier iterations. 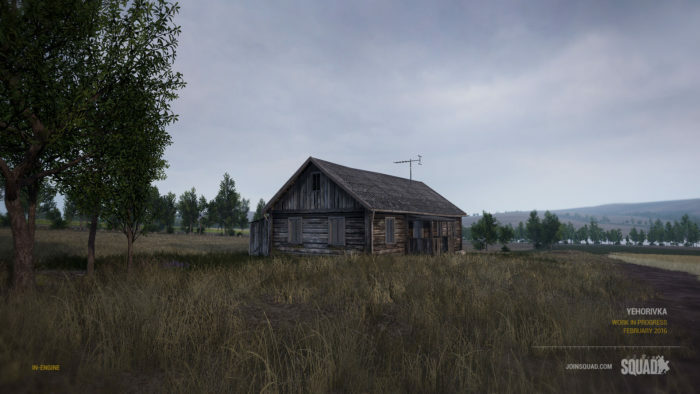 Improvements have been made made for the way that we display the player inventory, there has been some frustration among players, and devs, that the inventory system did not give good enough feedback to user actions, which we will address in two phases. Phase 1 will be a feature upgrade for the user interface of the inventory, we are adding expanding groups, which will give the player a better overview of equipment in a group, and we are adding fading to items that are not currently selected, making it much easier for the player to find the active weapon. Phase 2 will be adding the ability to change away from weapons while they are still just being equipped, which will allow the player to traverse the inventory with much more confidence without being punished for a small miss-click. Another quality of life improvement that has been long awaited and that we want to mention is name tag drawing reliability. We are now tracing from your camera location to the head, chest and feet of the other soldier, instead of the default Unreal Engine 4 method of tracing from waist to waist. This tracing method makes sure that you always get a name-tag when you can see your team members head, chest or feet, which solves a lot of issues for new and old players alike. We have also made some minor improvements to the feel of scoped weapons, namely giving them a post process effect around the reticle when zoomed. Lastly we have re-implemented the way that we handle jumping and stamina to allow for smoother traversal of walls and less frustration and stamina cost, while still stopping bunny-hopping and other game breakers. The system will now allow you to jump at full height with no stamina penalty, but with a loss of forward momentum and jump height for each consecutive jump. This allows you to be able to traverse walls with no worry of suddenly running out of stamina and reduces the frustration of the stamina cost. With the refactoring of our Animation System going underway there is a need to update almost all our animations to a newer and better standard. We recently brought aboard a new addition to the team, Kab, to help out in creating new animations for weapons and equipment new and old. Heres a few friendly Gifs to sate your appetite! 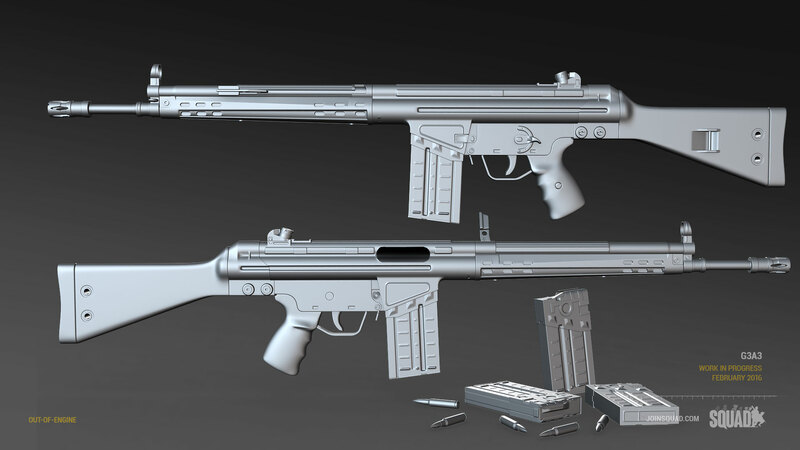 The G3A3 is a German 7.62x51mm NATO battle rifle developed in the 1950s, produced by license around the world. Still a very reliable platform, the rifle has seen many wars and conflicts around the world and is still in use by second-world militaries and insurgent groups to this day. Adding tunnel systems has always been a big wish list item for us and the latest Fools Road release gave us a quick crash course on how our game mechanics and code would react to them. Guided greatly by the things we have learned in the last month our environment artist Drav has begun formally working on a modular underground system that would allow our mappers to create more elaborate functional tunnel networks and create a whole extra dimension for Squad environments. Another exciting system that we’re working on is one for Doors, which will allow players to dynamically open and close passages, and further down the track, breach or even lock them. For now the system is in its infancy and we will be iterating on them well into the future. Continuing to push the envelope of map sizes we’re beginning work on a new map called Yehorivka, featuring large open expanses and a total 8km x 8km terrain size letting us open up the full expanses of the 4km x 4km base terrain and provide a real sandbox for vehicle based combat coming over the horizon. In its infancy but we will keep you guys posted! 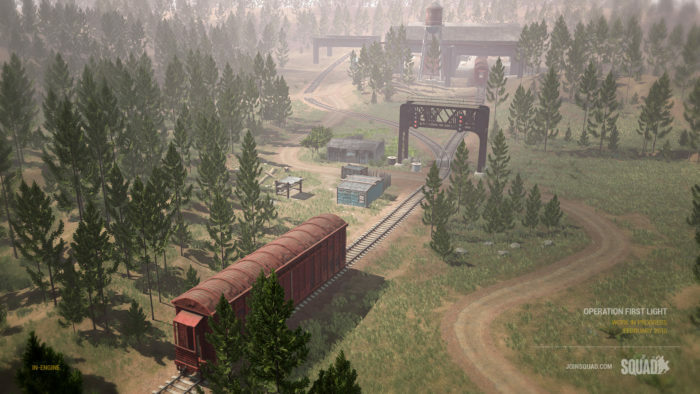 More work has been done on Gorodok since our last feature, here is featured a unique elevated rail system used to break up the landscape and present an interesting tactical obstacle for squads moving on foot. Bear in mind in these early stages that the lighting and detailing has not been done yet and will look dramatically different the closer we get to release. Operation First Light has been polished up to a near finished stage. (after popular request it not be scrapped!). Removal of the train wreck allows for the addition of an additional small village and fields. Over all the map has also gotten a good treatment of micro details of debris and trash to make it feel a little more lived in. 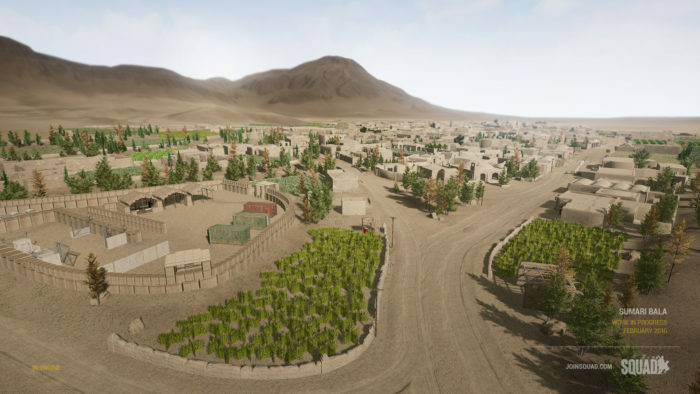 The expansion of the play area continues, and with the addition of numerous crop fields around the city edges, provides ample concealment for squads seeking to flank hardened positions. Chora continues to snake its way across the valley floor expanding both ways down the river and opening up some new combat areas. 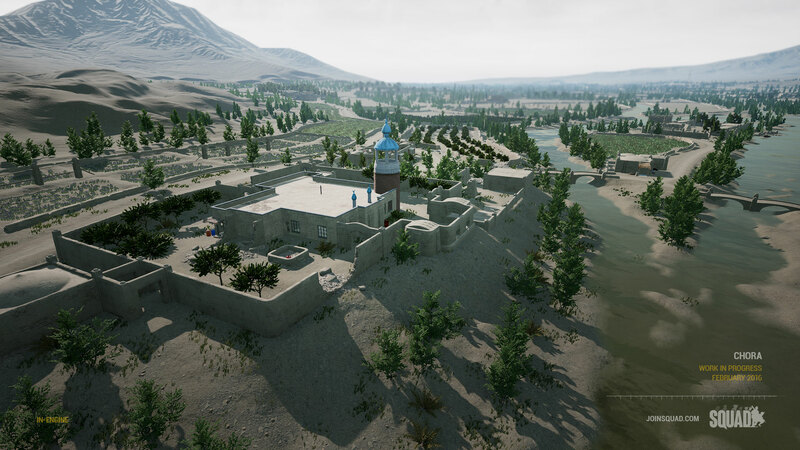 We expect another month to finish up the base compound layouts and then 2-3 months of detail polish and tweaking before this map finally gets close to a finished stage. We are also planning to integrate Truesky and some new terrain materials in this time frame as well. Thats all for this update but as ever we are furiously pounding away at the new content, squashing bugs and iterating till our fingers are raw. We appreciate everyones continued support and look forward to getting this content out to you as soon as possible. Onward and upward!